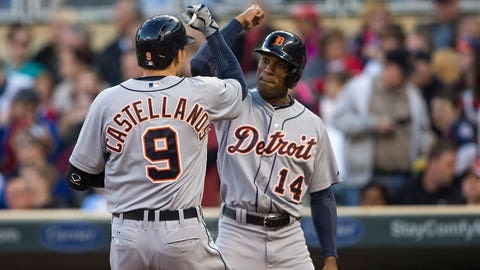 Nick Castellanos celebrates his two-run homer with Austin Jackson during the second inning Friday. MINNEAPOLIS (AP) — The Detroit Tigers had Kevin Correia on the ropes in the second inning but missed their first chance to knock him out. "We just got pitches that we could drive," said Hunter, who doubled twice among his three hits. "He left some balls up where we could capitalize on them. This guy pitches really well against us. We don’t score many runs off him. But tonight we felt good at the plate and I think we were a little patient today and got some pitches we could handle." Correia (0-3) gave up eight runs — seven earned — and eight hits in 2 1-3 innings for Minnesota. It was his shortest outing since going just two innings last Aug. 5 against the Royals. Correia served up a two-run homer to Castellanos in the second — and probably only got through that inning thanks to a poor decision by third base coach Dave Clark to send slow-footed Alex Avila from first base on a double by Andrew Romine. Avila was thrown out at home and Ian Kinsler grounded out to short-circuit the rally. "I was missing from the get-go," Correia said. "Balls were just kind of running back over the middle. I got away with it for an inning or so and then it caught up to me." "They teach that in baseball: The most important inning is the inning after your team scores," Tigers manager Brad Ausmus said. "We were able to bounce back and score not just a few but seven." "It’s something positive you can build off of and that’s what we’re going to do, try to carry it over to the next day," Hunter said. "Usually when you get a loss, as a human being you kind of think about that negative and it can carry over and linger. But since we won and it’s positive, just try to build off it."